This is Jewish idiom, pure and simple. And Weequahic High in 1937 was Jewish. I loved it. Every day was exciting, new things to learn, new things to do. The first half-year there, I was in the afternoon session- going from noon to five o'clock. This had a number of advantages In the evening, we would argue about algebra problems and shout Latin declensions at each other, and then in the morning, I would do my homework. David Lyons and I were in Latin class and for some reason the teacher, Mr. Aaron Franzblau, took a special interest in us. He nicknamed David, "Cupid" and me, "Weasel". My parents were not at all happy about this, but I was quite pleased. As the Weasel, I could do things that "Eli" could never do. I began to help some big boys with their homework, especially algebra and geometry, and in turn they would push me around the halls- I slid on the back edge of my leather heels- and shout "Here comes the Weasel!" I felt like the mastermind of a gangster mob, just like Edward G. Robinson in the movie "The Amazing Dr. Clitterhouse". 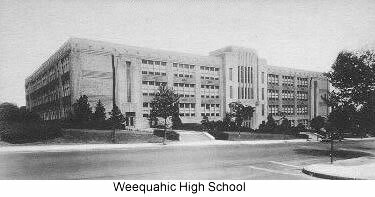 Weequahic High was not big in sports, although we competed in football and basketball. However, Jewish boys were not big or tall. Our football team lost all but one of our games. (Actually, we did have one big boy in the school- "Swede" Mason, but when his mother said that he couldn't play football, our hopes were dashed.) Our basketball team consisted of all short, fast guards. At a time when there was a center toss after each goal, that meant that the other team usually got the ball. Despite the handicap, our basketball team played fairly well, and ended its season with a 32-31 victory over rival South Side High. What we did have, however, was music- and lots of it. We had swing and jazz bands, a marching band, a bugle corps and a symphony orchestra. I signed up for the bugle battalion and played third trumpet- which meant that we were like the drums. We never played- or even heard- the melody. At football games, the drum major and the baton twirlers would march out, followed by the 48-piece bugle corps. After we were fully on the field, we parted, making a large aisle, down which came the 108-piece marching band. It was most impressive. The fact that we lost the first eight games of our schedule never fazed us. Our hated rival was Hillside High of Elizabeth, the next town. By a miracle, the final score was 6-6- a tremendous moral victory. It was cold and raining, but at the end of the game, we marched up and down that muddy field, playing in pure joy. This was the Age of the Big Bands. When the Artie Shaw and and Benny Goodman bands came to town at the same time- playing in neighboring movie theatres, our school practically emptied. We were there for five shows and more. I well remember when Benny Goodman's band began his theme song, playing behind the closed curtain and the drum began, we all knew that sound- It was Gene Krupa, who had been in trouble for narcotics. He was back and the place went crazy even before the curtain rose. Music at Weequahic High was Henry Melnick. Mr. Melnick was not only our music teacher. He staged major musical events. At the of one semester, he put on a musicale- consisting of all different types of musical performances- and ending with the combined symphony orchestra, marching band, bugle battalion and the high school chorus, playing his masterpiece. I was impressed with every facet of this performance, especially Mr. Melnick's musical theme. Several years later, I heard for the first time the Fourth Movement of Beethoven's Ninth Symphony- and shouted out- "That's Mr. Melnick's Theme!" It was about Mr. Melnick's Music Appreciation class in my first semester at Weequahic High that I had my only run-in with my mother concerning my marks. For some reason, my mid-term mark was a "D". My mother was furious. "You are the son of an outstanding pianist! You will not get a bad mark in Music Appreciation. You will get to work!" Under her driving and her direct participation, I produced three papers, consisting of pictures and words one on the instruments of the orchestra, another on famous composers, and the third on musical history. Mr. Melnick gave me "Triple A's" on each one, so that my final grade mark was an "A". My mother was satisfied. I felt that she had earned the good grade. The second half of my Freshman Year began in September, 1937. I was now on the regular schedule and rode my bike to school. For the first time I was taking a full lunch to school. My daily diet consisted of Rice Crispy cereal for breakfast, two boiled ham sandwiches on white bread for lunch, two "Mighty Fine" chocolate puddings with two glasses of milk at 4 PM and then dinner. This remained my daily diet for the next three years. I was convinced that at some point Rice Crispy box tops would become valuable and so I collected them in stacks of 25. Nothing came of that, of course. At the beginning at 1938, my folks opened a candy store in Maplewood, New Jersey. (I'll speak more about this in a separate chapter.) However, it was clear that we would be moving from Newark and that this would be my last semester at Weequahic. My new school would be Columbia High in South Orange-Maplewood. It was a strange school term, in that my parents were not at home when I came back from school. My grandmother took care of the house. My school work went well. I especially liked Geometry with its logic and became the "star" of my class in competition with other Geometry sections. On weekends, I would sometimes take the buses to the candy store, so that I began to see less of my boyhood friends. Sometime before the semester ended, I made a trip to Columbia High School and met with a school counselor. Columbia High was on a standard full year term basis, and I was out of sync since I began each school year in February. I would have completed 1 1/2 years of school by September, 1938. The counselor gave me two choices, I could lose a half-year, entering Columbia as a sophomore, or I could take two summer school courses at East Orange High School and enter Columbia as a junior. I chose the latter alternative. We moved to South Orange in June, 1938. In July, I began taking the two summer school courses in Geometry and Latin. The courses lasted six weeks. I rode my bike from South Orange to East Orange, a distance of perhaps five or six miles. Summer school classes were held as make-ups for students who failed the courses during the regular semester. Thus I was the only student in either class who really wanted to be there and the only one to whom the content was completely new. The teachers were fine and I received two marks of "B". Now I could enter Columbia High as a junior. I was fourteen years old.